The human ear is a complex and amazing system. 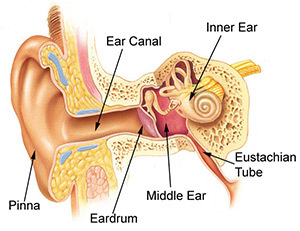 Hearing begins when sound waves are collected by the outer ear (or pinna) and are funneled down through the ear canal. At the end of the ear canal the sound waves reach the eardrum (or tympanic membrane). Behind the eardrum lies a cavity called the middle ear space. The middle ear space contains three small bones; the malleus (aka the hammer), the incus (aka the anvil) and the stapes (aka the stirrup). When the sound waves strike the eardrum, vibrations occur which move the bones of the ossicular chain. Movement of the malleus, imparts movement on the incus and movement of the incus, imparts movement to the stapes. This middle ear process converts the sound waves from acoustic energy into mechanical energy and amplifies the intensity of the sound. The movement of the stapes then transfers this energy, in a hydraulic fashion, to the fluid filled inner ear. The inner ear consists of the hearing organ (or cochlea) and the auditory nerve fibers which travel to the brain. The inner ear converts the hydraulic sound energy into neural impulses via the movement of tiny hair cells within the cochlea. These impulses then travel to the brain where they are decoded and interpreted into our perception of sound. As long as all parts of the auditory system function correctly and the message is not distorted along the way, normal hearing can occur. As you can see however, there are many opportunities along the pathway for the signal to become degraded resulting in hearing loss. Hearing loss is much more common than most people realize. The latest Marke Trak survey data estimates that 34 million Americans have a hearing loss. This includes; 3 out of every 10 people over the age of sixty, 1 out of every 10 baby boomers (those aged 41-59 years), 1 out of every 14 Generation X’ers (those aged 29-40), 1.4 million children (those aged 18 or younger) and 3 out of every 1000 newborns. The sad reality about hearing loss is that although most losses can be treated, many people continue to struggle needlessly. An untreated hearing loss affects not only an individual’s quality of life but also relationships with family, friends and co-workers. Long-term untreated hearing loss has been shown to lead to increased stress, fatigue, depression and social withdrawal. The signs of hearing loss are typically very subtle and occur gradually over time, though they can also be severe and sudden. 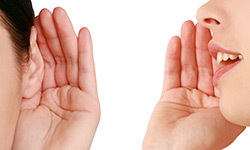 Regardless of onset, most types of hearing loss share similar indicators. If you experience any of the following, you may have hearing loss and should ask to be tested. Here at the AFA Balance & Hearing Institute you’ll receive a thorough hearing evaluation using state-of-the-art equipment and evidence-based methods. We will review your results, listen to your concerns and answer any questions that you may have. There are different types of hearing loss (conductive, sensorineural, mixed and central) so identifying the correct type will help determine what can be done about it. If your hearing loss can be corrected medically, we will explain your options and make the appropriate referral, as needed. If hearing aids are right for you, we work with most major manufacturers and can almost always find something that fits both your hearing needs and your financial concerns. Hearing Instruments come in a number of shapes, sizes and technology levels to accommodate each person’s unique lifestyle, cosmetic preferences and budget. The combination of possibilities is nearly endless. Additionally, recent advances in digital technology have made the instruments smaller, smarter and easier to use. Digital technology allows hearing aids to deliver a more natural sound, to identify and prioritize specific inputs (such as amplifying desired sounds, like human speech while reducing undesirable ones, like types of background noise) and has helped to virtually eliminate feedback (that whistling sound you sometimes got with older hearing devices). In fact, many hearing instruments today function like miniature computers and are capable of interacting with other electronic devices such as smartphones, iPods/MP3 players and television to deliver sounds directly and wirelessly to the listener’s ear. The technology has really come a long way in the past decade. Completely In the Canal (CIC) – cosmetically appealing (nearly invisible), potential for plugged ear feeling (called occlusion), easy telephone use, requires good dexterity to insert and remove, shorter battery life, occasional wax buildup, no directional microphones or wireless capability. Fits mild to moderate hearing loss (up to 65dB HL). In the Canal (ITC)/Half Shell (HS) – cosmetically appealing (slightly visible), less occlusion, easy telephone use, requires good dexterity to insert and remove, wireless communication and directional microphones available. Fits mild to severe hearing loss (up to 70dB HL). Full Shell In the Ear (ITE) – Visible in the ear, easy to handle, less occlusion, more power, better battery life, wireless communication and directional microphones available. Fits mild to severe hearing loss (up to 75dB HL). Micro Behind the Ear (micro BTE) – Cosmetically appealing (nearly invisible), no occlusion, easy to insert, wireless communication and directional microphones available. Fits mild to severe hearing loss (up to 75dB HL). Behind the Ear (BTE) - Cosmetically appealing (slightly visible), easier to handle, good durability, wireless communication and directional microphones available. Fits mild to profound hearing loss (up to 100dB HL). Power Behind the Ear (power BTE) - Cosmetically appealing (slightly visible), easier to handle, good durability, the most power, wireless communication and directional microphones available. Fits moderately severe to profound hearing loss (up to 120dB HL). The AFA Balance & Hearing Institute works with most major manufacturers and can almost always find something that fits your hearing needs, your technology wishes and your financial concerns. We offer the latest technologies from trusted companies with outstanding customer service. The AFA Institute offers a 60-day no-risk trial period for all new hearing aid fittings utilizes Real Ear/ Speech Mapping to verify your hearing devices are delivering the correct output to the ears and has a complete technology lab on site to service/repair most hearing aid brands. The AFA Balance & Hearing Institute is committed to improving the lives of our patients by providing compassionate care, patient education and outstanding service at affordable fees. From diagnostic hearing and balance evaluations to state-of-the-art hearing instrument fittings, we take pride in all that we do. The AFA Institute at A.T. Still University supports the provision of wellness and a higher standard of excellence through the education we provide our students, through our community service and through our service to our patients. Audiologists and Hearing Aid Dealers: Who is Who? Not everyone who dispenses hearing aids is an audiologist. Consumers should do their homework about the professional they choose to work with before investing their time and money. Audiologists must complete, at minimum, an undergraduate and master’s level degree in audiology and a supervised clinical fellowship program prior to obtaining state licensure. Since 2007, the minimum standard of education for audiologists entering the profession is a clinical doctorate (Au.D. ), reflecting the need for increased training and experience as the audiology scope of practice has grown and technology has advanced. This usually requires a minimum of eight years of post-secondary education, four years of which is focused on the medical, diagnostic and rehabilitative aspects of hearing loss and hearing aids. Audiologists must also pass a national standardized examination of core competencies in diagnosis and management of hearing loss in order to become eligible for state licensure. 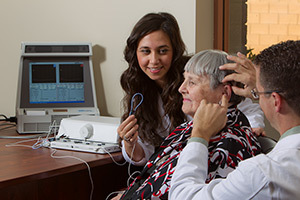 Audiologists are employed in a variety of settings including hospitals, medical clinics, school systems, universities, industry and private practice. Hearing aid dispensers (sometimes called hearing instrument specialists or audioprosthologists) are also licensed by the state that they practice in, but the steps toward licensure are significantly less than those taken by audiologists. The licensure requirement varies from state to state but in Arizona hearing aid dispensers must have at least a high school diploma or GED and must pass the state’s written and practical dispensing examination. Hearing aid dispensers are typically employed in private practice or retail settings. These days, people shop online for everything from clothes to cars. While the internet is a great resource for learning about hearing aids, consumers should be very wary of purchasing any device online. Purchasing hearing aids over the internet might seem like a good way to save a little money but we don’t recommend it for many reasons. First, the Department of Health has cautioned all consumers about online hearing aid sales and stressed the importance of seeing a hearing health professional if they are concerned about a potential hearing loss. When purchasing a device online, there is no way to conduct a true medical evaluation so ear pathologies can be easily missed. Second, everyone’s hearing loss is unique. Hearing loss can occur at many different frequency ranges so needs vary significantly from person to person. Third, not every hearing aid will work for every type or severity of hearing loss. It would be very easy to purchase a device online that will not work for your specific level of impairment. Lastly, many of the devices sold online are actually not hearing aids at all but rather personal sound amplifiers that look like hearing aids. These devices often amplify specific frequencies that you do not need amplified, providing little to no benefit. Saving money is often cited as the main reason why someone chose to purchase their hearing aids online. While getting them over the internet might save you a few hundred dollars up front, keep in mind that you still are going to have to pay someone to program and service them. Additionally, you may be sacrificing things like features, warranty service and safety by buying from an online vendor. In most cases, the money you think that you have saved will ultimately be spent in the long run. In spite of all this, if you still want to purchase your hearing aid online, please call us for advice first. You could be making a potentially unsafe or expensive error that could cost you for years to come. Assistive Listening Devices (ALDs) include any technology used to provide increased hearing ability in a variety of situations. ALDs are most commonly used to assist hearing aid or cochlear implant wearers that need more assistance in performing daily activities, however ALDs can also be used by those who do not wear hearing aids or those who only need increased audibility for certain activities. For example, an ALD may be used to help people listen to television, music players or the telephone. They are also useful in large public venues such as churches, theaters or lecture halls and are useful to help people hear through public address systems where competing noise or distance from the sound source may be a hindrance. The ALD is typically used as a system where the audio source is broadcast wirelessly using FM frequency, Bluetooth or infrared. The person who is listening picks up the signal using a receiver or similar technology and adjusts it to listen at the preferred volume. Common ALDs include vibrating alarm clocks, amplified doorbell ringers, amplified telephones, television ears, strobe alerting devices and personal listening systems. Made for iPhone Hearing Aids - Pairs with an iPhone to deliver clearer phone conversations, music, FaceTime calls and more. Syncing is available with compatible hearing aids and easy to set up on iOS devices. Pocket Talker - A battery-powered sound amplifier that sits in your pocket and connects to headphones. It is an inexpensive substitute for people who can't wear, can’t afford or who have cognitive difficulties that prevent hearing aid use. TV Ears – A wireless headset you wear that allows you to connect to your television via FM technology. TV Ears allow the wearer to control the volume of the television separate from other listeners’ volume. Sennheisser TV System – A wireless infrared or Bluetooth headset system that connects directly to the audio output of your TV, DVD player or any other compatible audio device to deliver high-quality sound. Television Loop System – An amplifier that connects to the television/stereo system and a teleloop placed along a wall or along the floor where the user wishes to hear the TV/stereo. The teleloop amplifier transmits the sound out to the teleloop where the telecoil in the hearing aid can capture and transmit the sound. This allows family members to listen to the TV at a comfortable level separate from the hearing aid wearer. Alerting: Alarm Clocks – Devices that flash lights, change volume or pitch and/or vibrate your bed in combination. Alerting: Door Bell Signaler – Devices that alert you to a door bell via flashing lights or interacting with an alarm clock. Sonic Telephone/Videophone Ring Signaler –Signaling device that alerts you to a phone call. Amplified Telephones – A telephone which is equipped with a sound amplification device such as an amplified headset or a freestanding amplifier. Amplified phones are available for purchase through The AFA Institute or for FREE through Arizona Telecommunications Equipment Distribution Program.